It’s time to GET OUT THE VOTE! Canvassing and phone banking activities are taking place in Medford multiple times per day from today through Election Day. Swing Left is also organizing canvassing trips to Congressional swing districts in New Hampshire and Maine. And, of course, don’t forget to vote on Tuesday, if you didn’t already vote early! Polls will be open 7am to 8pm. You can find your polling place here. There are multiple canvassing and phone banking opportunities throughout this weekend to support Elizabeth Warren, Maura Healey, Jay Gonzalez, Katherine Clark, and all our Democratic candidates. Find the full list of dates and times here. Our Congressional representative, Katherine Clark, and state Senator, Pat Jehlen, joined in on one of the Medford canvasses last weekend! Next weekend, and through Election Day, there will be additional events throughout the city to get out the vote. Following the primary election, please join the unified Democratic Party in a day of action on September 8. Canvass in Medford for Elizabeth Warren, Maura Healey, and all the local and state Democratic candidates on the ballot. 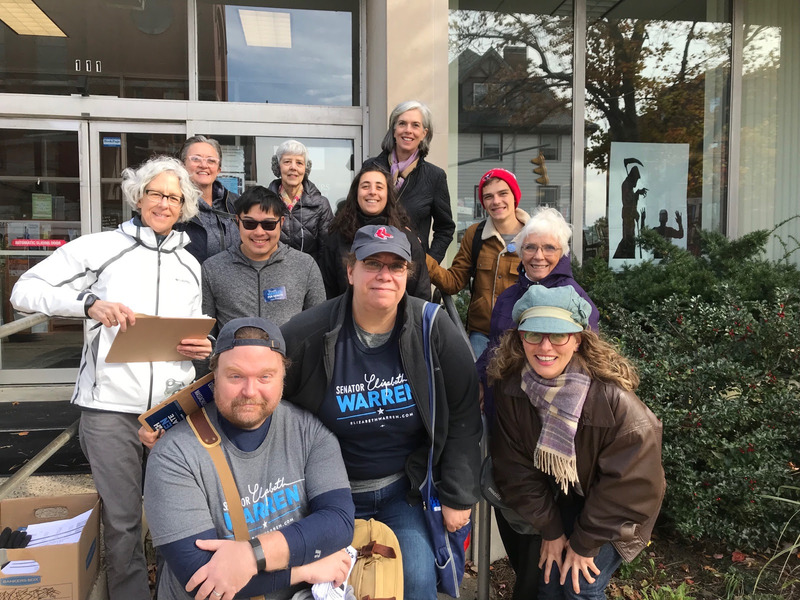 Team Warren and Team Healey have a number of canvasses planned throughout the state this weekend. Join them on Saturday or Sunday and talk to voters about why we are working hard to ensure they’re re-elected! Holyoke (284 High Street) – 10 a.m.
Somerville (41 Chetwynd Road) – 10 a.m.
Groveland (5 Pinewood Lane) – 10 a.m.
Allston (1243 Commonwealth Avenue) – 10 a.m.
Acton (130 Main Street) – 10:30 a.m.
Worcester (29 Endicott Street, Suite 2) – 10:30 a.m.
Ashland (301 Pond Street) – 10:30 a.m.
Sudbury (326 Concord Road) – 10:30 a.m.
Belmont (95 Washington Street) – 10:30 a.m.
Malden (401 Pleasant Street) – 10:30 a.m.
Andover (36 Bartlett Street) – 1 p.m.
Waltham (494 Lincoln Street) – 11 a.m.
Woburn (69 Bedford Street) – 11 a.m.
Medford (495 Fulton Street) – 11 a.m.
Cambridge (70 Rindge Avenue) – 11 a.m.
Beverly (100 Sohier Road) – 11 a.m.
South End (100 Dedham Street) – 11 a.m.
Roxbury (15 Warren Street) – 11 a.m.
Norwood (685 Washington Street) – 12 p.m.
Westford (99 Plain Road) – 1 p.m.
Mission Hill (1524 Tremont Street) – 1 p.m.
Leominster (307 Whitney Street) – 2 p.m.
Gardner (221 Main Street) – 2 p.m.
Milford (31 Main Street) – 2 p.m.
Ipswich (65 Central Street) – 2 p.m. The next meeting of the Medford Democratic City Committee will feature gubernatorial candidate Bob Massie. Bob Massie is running for Governor of Massachusetts in 2018. He is an environmentalist. Before entering the race for governor he was leading a climate preparedness, research, and development lab at the University of Massachusetts, Boston. The September 20 Medford Democratic City Committee meeting featuring gubernatorial candidate Jay Gonzalez will now take place at the Senior Center, 101 Riverside Ave. The time remains unchanged at 7pm. The next meeting of the Medford Democratic City Committee will take place Wednesday, September 20. Time and location are to be confirmed, but are currently expected to be at 7pm at Medford City Hall’s Alden Chambers the Medford Senior Center, 101 Riverside Ave. The guest speaker will be Jay Gonzalez, Democratic candidate for Governor. Jay was the Secretary of Administration and Finance under Governor Deval Patrick.